Click the image for a description of lake level control from the county drain commissioner. The comment about the lake level being five inches above normal refers to an earlier year, since the level in the spring of 2014 was two feet above normal. 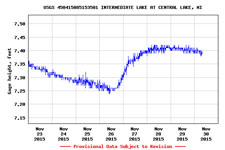 Click this image to display the current United States Geological Survey graph of the lake level measured at the Central Lake bridge. Normal levels are 7.15 feet for summer and 6.54 feet for winter.